A ROOF has collapsed at a church in Nigeria, killing at least 60 people and possibly as many as 200. A church roof collapsed in southeastern Nigeria causing "many deaths and injury" the country's president said Saturday, with state media reporting that up to 200 people could have been killed. The evangelical Reigners Bible Ministry in Uyo, capital of Akwa Ibom state was packed with worshippers when the roof — which was still under construction — collapsed, local media said, with the state-run Nigerian News Agency saying "between 50 and 200" people could have been killed. A rescue operation is underway, the report said. President Muhammadu Buhari sent his condolences, telling "the Governor and the People of Akwa Ibom State, the deep sorrow of his family, the government and the entire people of Nigeria over the many deaths and injury recorded following the incident," presidential spokesman Garba Shehu said in a statement. The governor of Akwa Ibom state, who was at the church but was not injured during the accident, said on his Facebook page late Saturday that "we have never had such a shocking incident in the history of our dear state." 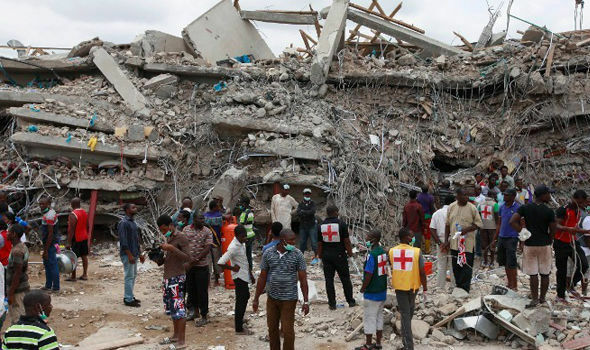 In September 2015, 115 people including 84 South Africans, were killed in Lagos in the collapse of a church belonging to the famous televangelist TB Joshua.